Comments: Jedi mind tricks often work on the weak-minded. Such is the case when a sqaud of sandtroopers ask Jedi Master Obi-Wan Kenobi about the two droids he’s escorting in a landspeeder. Obi-Wan makes short work of these sandtroopers, and they conclude that "these aren't the droids we're looking for." Luke Skywalker is amazed at Obi-Wan’s ability to easily fool their pursuers. 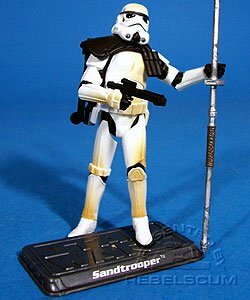 This Sandtrooper figure is a retooled version of the VOTC Stormtrooper with a new belt and added accessories. 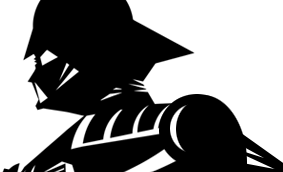 Due the torse articulation, the thermal detonator and the survival backpack cannot be worn at the same time. However, the detonator can be stored inside the backpack when not in use. The black-pauldron Sandtroopers are also known as Sandtrooper Corporals.